The newspaper stopped publishing in print last year. Now it could make another landmark move. A man reads the final print edition of the French language newspaper La Presse at a coffee shop in Vaudreuil-Dorion, west of Montreal, Sat. Dec. 30, 2017. La Presse news group plans to adopt a not-for-profit structure, if Quebec allows it to do so, the company announced Tuesday. Montreal-based La Presse news group plans to adopt a not-for-profit structure, if Quebec allows it to do so, the company announced Tuesday. 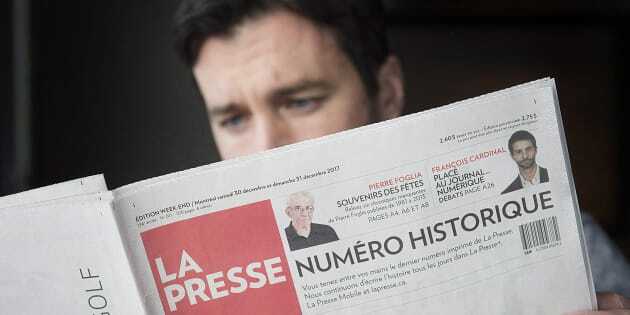 The structural change requires the Quebec government to repeal a provision of a Private Act adopted in 1967, regarding La Presse's ownership, the French-language publication said in a statement. Power Corporation of Canada, whose subsidiary Square Victoria Communications Group currently owns the 130-year-old publication, will grant $50 million to the venture. Under the new structure, Power Corp. would no longer own the media company or have any ties with the not-for-profit structure, La Presse said. BLOG: It Was A Brutal Week For Newspapers. It Doesn't Have To Happen Again. La Presse president Pierre-Elliott Levasseur thanked the corporation, its co-CEO Andre Desmarais and the Desmarais family for their "untiring support" over the past 50 years. The money will help the news organization focus on its strategic plan and bring together the necessary conditions to expand its support base, La Presse said. Under the new structure, La Presse will use operational profits, any government assistance and donor funds to serve its goal of producing high-quality reporting. The not-for-profit model "is designed to be a modern approach adapted to the realities of today's written media," the company said. Traditional media in the country are grappling with the loss of advertising revenue, resulting in mass layoffs, publication closures and a shift to fewer print editions and more online publications. Nearly a year ago, La Presse announced it would end its print edition in 2017 and publish only on its website and tablet edition. The organization urged the federal government to financially support the written press through philanthropic models and direct assistance when it made its announcement. The Liberal government proposed $50 million over five years to support independent, non-governmental organizations that will spur on local journalism in under-served communities. The budget also said the government will spend the next year exploring models that would allow private giving or philanthropic support for non-profit journalism and local news. La Presse's parent company holds an investment in The Canadian Press as part of a joint agreement with Torstar and a subsidiary of the Globe and Mail.